Librarians of the world, rejoice! Have I got a children’s book for you. 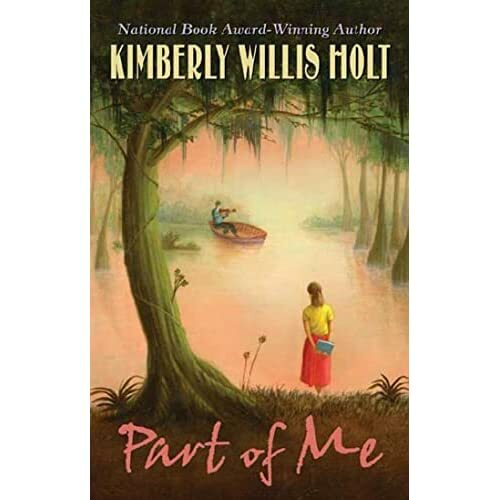 Because Kimberly Willis Holt is a sweetheart, I know that her book, “Part of Me”, must have come out of a very special place in her heart. Inspired in part by, “Down Cut Shin Creek: The Pack Horse Librarians of Kentucky” alongside seven generations of Holt's own family that have lived in Louisiana, this book has its roots in a variety of different places. That said, I’ve never read a children’s book that was so clearly bound to be adored by a single profession as this l’il puppy. If you know a librarian and you want to make them happy, good news. Your gift-giving qualms may be safely put to rest. The story begins when Rose’s father leaves. Her family had been eeking out a living as best they could until that time. But when Conrad McKee left his wife and three kids that day, it wasn’t long before they packed up and moved to Houma, Louisiana. Deep in the Louisiana bayou, Rose gets a job as a bookmobile driver, putting aside her dreams of finishing high school and attending college. “Part of Me”, follows four generations of Rose’s family, starting with her, and going down through her descendants a generation at a time. Rose’s son Merle has a story in this book involving trapping, a hurt dog, and how “Old Yeller” touched his life. His daughter Annabeth, in turn, suffers the humiliations of unpopularity while finding her own inner strength in stories where the princess does NOT end up with a prince at the end. Her son Kyle, in contrast, couldn’t care less about books. Then a particularly good one get him hooked. Finally, by the story’s end, we return to Rose and her greatest dream realized. First of all, thank you, Kimberly Willis Holt, for the family tree at the beginning of the book. There’s nothing worse than a story that jumps from generation to generation without a simple map for the reader to follow. I’m fairly bad with names too, so it was nice to have a part of the book to continually check as a reference. Of course, reading through the family tree was bound to give away some secrets as to who marries who, but if you’re willing to put up with that then you’ll have no problems at all. The book might jump from one character to another, but as long as you have the family tree available, you’ll have no troubles. The writing itself is great, of course. Holt has the ability to make each character’s voice distinct and separate from the rest. Bear in mind that these are quiet stories. With the exception of a little bloodshed in Merle’s tale, you will find no chase sequences, dark-hearted villains, or action sequences here. You will find a little cussing and a little alcohol use (though the term “hair of the dog” is never actually used . . . ), but nothing mind-blowing. One librarian I heard discussing this book called it a summer story. Most of the tales here do take place in the summer months, but I’m not sure if that’s how I would best characterize it. It’s just a measured, balanced series of family tales. It's the equivalent of sitting on your porch listening to your relatives recount their past adventures. All right. The one hundred million dollar question here: Will kids like this book? I say yes, but with some caveats. First of all, this is not a reluctant reader title. You want to give a book to a child who only reads Manga and maybe some “Harry Potter”? This may not be the best choice to give. The cover alone makes it infinitely clear that this is a book for those children who love reading. Better still, those who love reading about realistic people and situations. I have little doubt that a lot of kids will find themselves sympathizing with Annabeth’s desire to be popular or Merle’s affection for his dog and his trapping. I, personally, saw a lot of my own siblings in book-avoiding Kyle. Holt cleverly balances the text between boys and girls too so, in spite of its pastel cover, boys will find characters here to take some interest in. All in all, it’s a nice book. Not a stunning book but a nice one. With Louisiana so often in the news these days, it’s nice to read something that reminds us of that region’s charms and beauties. Librarians are gonna buy it in droves. Books that will make librarians go "oh, they love us! they really love us!" should have their own section in the library. Meanwhile, I, of course, am looking to see if my system owns it. Review of the Day: Phineas L. MacGuire Erupts! HEY! Illustrators! Call For Entries, Here!